JEE Main Application Form 2018 has been released on 1st December. 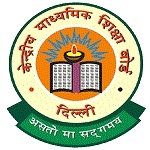 JEE Main 2018 is conducted by the Central Board of Secondary Education (CBSE), New Delhi. Through this exam, candidates can get admission into various UG engineering seats offered by the all IITs and NITs across the country. In this article, we have compiled the detailed application procedure to facilitate the candidates so that they may come to know that how to apply for JEE Main 2018. JEE Main 2018 Application Form has been released on 1st December 2017. Click here for application form. The online registration for JEE Main 2018 has been started from 1st December 2017. Candidates can fill the application through online mode from the official site. No hard copy of the application form is entertained. Candidates are able to fill the application form till 1st January 2018. 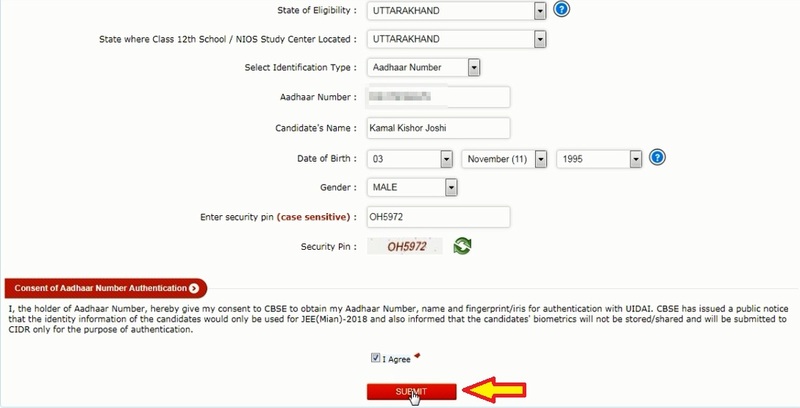 Aadhaar Card is compulsory to fill the application form. Candidates also have to book slot for the online mode exam while filling up the application form. Click on the link for apply for JEE Main 2018. Read the Adhaar Card detrails. Exam Related Details: Fill the exam detail like applying for, mode of examination, exam centre and exam medium. Personal Details: Fill the personal details like name, father/mother name, state of eligibility, category, DOB, nationality, gender and place of residence. Academic Details: Fill the fields for academic details like year of passing, school board etc. Mailing Address Details: Fill the mailing details including address, mail ID and contact No. Guardians Details: Fill the qualification, occupation and annual income of guardians. You will be redirected to this review page. You may change your details by press the “edit credential” button or may go to the “final submit” button. Now click on verify mobile number. Enter the verification code sent to your registered mobile number. Enter security pin & press submit. After clicking on verify mail ID, enter the verification code sent to your registered mail ID. 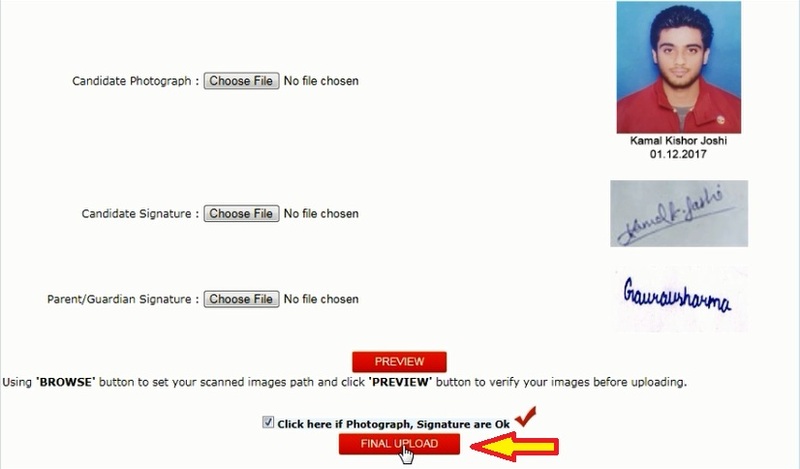 Click on the button for ‘UPLOAD SCANNED IMAGES‘. Upload the photo and signatures one by one. Click on the preview button and change if found not OK.
Make final upload and go to the next step. The photograph should be passport size with name and date of taking photograph. The photograph should be coloured or b/w with the clear background (prefer white/blue background). The size should be 3.5 x 4.5 cm (width x height). File size should be more than 4 kb and less than 40 kb. The photograph should be clear (without blur or smudge). The signatures (candidate’s and parents) should be done by the candidates only as it may be checked any time frequently. Signature will be accepted on the white page only. Take the white sheet and mark the box size of 3.5 x 1.5 cm. Save in file size is not less than 1 kb and not more than 30 kb. Select the mode of payment as via credit/debit card/paytm or via depositing fee in cash in the Syndicate/Canara/ICICI bank through e-challan. In case the examination fee is paid through credit/debit cards, select the payment gateway. In case of selecting challan, an e-Challan will be generated containing specific details of the candidate along with the amount to be paid. The candidate has to take a printout of the same and take it to the nearest branch of the selected bank for making payment. Now, click on “click here to go home”. After successful payment, the candidates (those opted the CBT exam) have to select/choose the exam date. 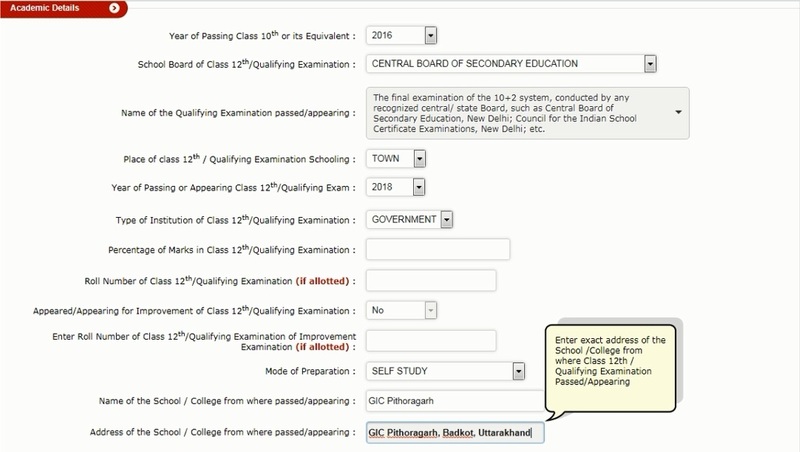 Candidates also have to book their slot/date (In case of opting computer-based examination). Candidates should secure their user ID, password and application form number for the further communication as it may be entertained until the end of admission procedure. Select the exam date and press on submit. Now click on Home page. In case the acknowledgement page is not generated after payment of fee then the transaction is cancelled and the amount will be refunded to the candidate account within a week and however the candidate has to make another transaction till the Acknowledgment Page is not generated. After the confirmation of fee deposited from Bank/CBSE, the candidate will be able to print the Acknowledgment Page, by login to their account again. In case the Acknowledgment Page is not generated, the candidate should contact the concerned bank/branch to update his/her transaction. Now safely logout the window. If you have any query about How to Apply for JEE Main 2018, you can ask us by leaving your comments in the comment box.